Premier League stats: Is Eden Hazard having a deceptively good season for Chelsea? 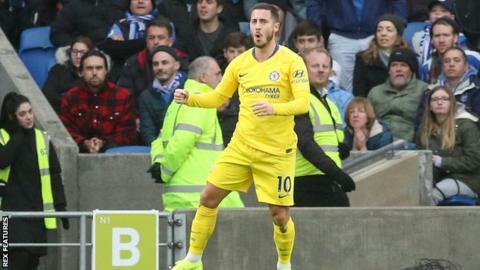 There had been no goals since the start of October, plus concerns over his fitness and speculation over his future – but remarkably Eden Hazard is arguably having his best season in a Chelsea shirt. The 27-year-old came into Sunday’s match at Brighton having not found the net in nine games, but against the Seagulls he ended that run and fulfilled his ‘false nine’ role to a T by setting up Pedro for the opener before scoring himself. The reports will trumpet his goal and assist in the 2-1 win, but maybe they should highlight the fact he has now been involved in more Premier League goals this season (17 in 16 appearances) than he had in the whole of last season (16 in 34 appearances). The Belgian has also now provided more assists in league competition than any other player in the top five European leagues. Hazard at Chelsea – better than ever? Former Tottenham midfielder Jermaine Jenas said earlier this season that Hazard was not in the same league as Barcelona’s Lionel Messi and Juventus’ Cristiano Ronaldo. That was three months ago – should these updated statistics change his opinion? How do you control possession for three-quarters of a football match and still lose it? Huddersfield had 73.6% of possession in the 1-0 home defeat by Newcastle on Saturday – the highest percentage of any side to lose a Premier League game this season. Perhaps David Wagner’s side should look to Leicester’s 2015-16 title winners, who laughed in the face of possession by winning the title with 44.8%. Liverpool, basking in the afterglow of beating arch-rivals Manchester United, hold the ‘Premier League team with the highest possession but end up losing’ title having had 80.38% of possession in their 2-0 defeat at Burnley in August 2016. Speaking of the Clarets, that wide grin at the end of last season – when they finished seventh – has now all but disappeared. Having let in only 39 goals during the entire 2017-18 Premier League campaign, they have already conceded 33 times in 17 games. They managed 12 clean-sheets last season and have managed only four so far. During the 1-0 defeat by Tottenham, they failed to register a single shot on target. It was the third time they had achieved that distinction this season – no other Premier League side has done so more than once. Perhaps it should come as no surprise that they currently hold the unwanted honour of the fewest shots on target by an English top-flight team this season. After spending nearly £90m in the summer, Everton supporters should ignore their eighth position in the table – and the fact they have 15 points fewer than third-place Tottenham, who did not spend a penny. That one goal scored against Manchester City in Saturday’s 3-1 defeat meant that the Toffees have now scored more in the league against the Citizens than any of their rivals, since manager Pep Guardiola took the Etihad hot-seat in 2016. That’s as good as a title, is it not, Everton fans?